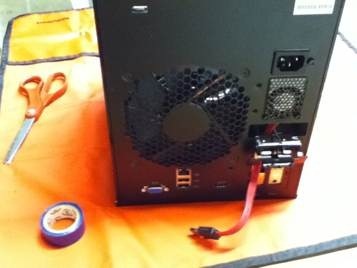 I recently completed setting up my new HP ProLiant N40L MicroServer that I purchased at Newegg.com. 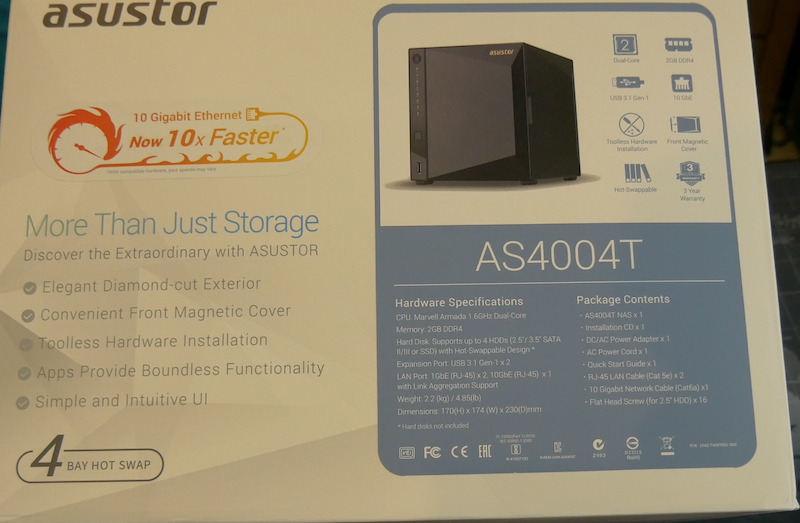 It was a special combo deal that included the MicroServer and a copy of Windows Home Server 2011. 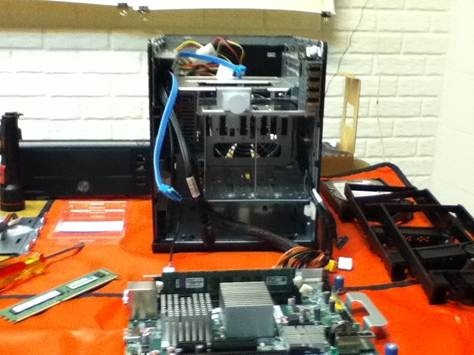 At this site, HP MicroServer Self Repair Videos there are repair videos from HP that show how to disassemble the MicroServer and among other things install new or additional RAM onto the motherboard. These videos are a must watch in my opinion before you attempt any DIY work on the MicroServer. I ordered and installed the Kingston Model KVR1333D3E9SK2/8G which is two 4GB sticks of ECC memory. 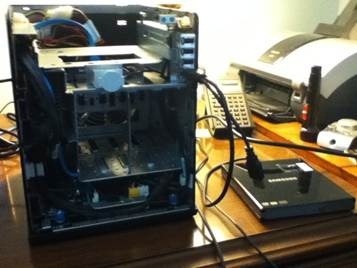 I then flashed the modified BIOS from BIOS-MODS to my MicroServer using John Zajdler's, @DieHarder on twitter, Diehard in the HomeServershow.com forums, guide and suggestions. I would just like to note that DieHard is a rock star! I followed his notes and suggestions and I had no problems getting BIOS-MODS modified BIOS that would unlock many of the hidden features on the MicroServer – especially enabling me to set SATA port 4 (the mother board port for the ODD (Optical Disk Drive) if installed and port 5 (the eSATA port on the back of the case to AHCI and at a higher port speed than it’s default. Set up the Flash and it almost immediately took me to a C:\ prompt after the BIOS had successfully been flashed. 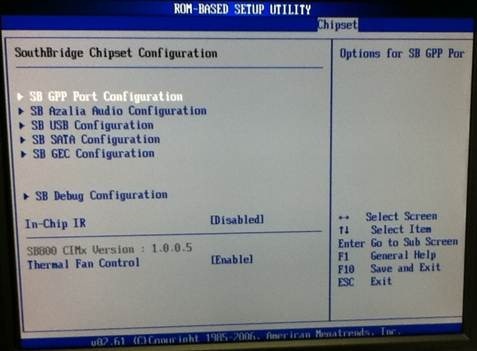 I then rebooted and hit F10 to get into the BIOS -- Realized I made a mistake not checking the BIOS before flashing it but as I poked around I found many new options that people had written about so I knew I had the modified BIOS. It Looked like all ports 0-5 are set for AHCI in the Advanced Menu – which is correct but you need to make additional changes to get ports 4 & 5 to AHCI and high speed. Under IDE Configuration in the advanced Menu it has the option of setting AHCI speed to Auto, 1.5, & 3 – initially I left it on Auto but later on DieHard’s suggestion I changed it to 3. The SATA ESP on all PORT makes all SATA ports hot swappable. · Enable OnChip Sata Channel, OnChip IDE Type to IDE, Sata ID Combined Mode to Disabled and SATA ESP and SATA Power on all PORT to Enabled. 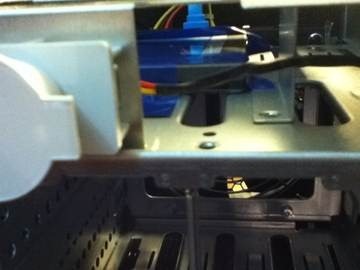 Then I installed a Crucial M4 128GB SSD as my OS drive located in the space above the 4 drive bay and below the ODD bay in the MicroServer after clearing out the power cables there by re-routing them in the cable run on the side above the power supply. See pictures here of the SSD location. The SSD is running from Port 5. SSD Location: I installed the SSD in the open space below the ODD (Optical Disk Drive) bay and above the main 4 drive bay. This is actually be an excellent space for a floppy drive installation except for the “HP” lighted logo in front. Note: in the last picture the book “Windows Server 2008 R2 – Unleashed” is opened to Chapter 3 “Installing Window’s Server 2008 R2”. This is a great book for reference in my opinion. 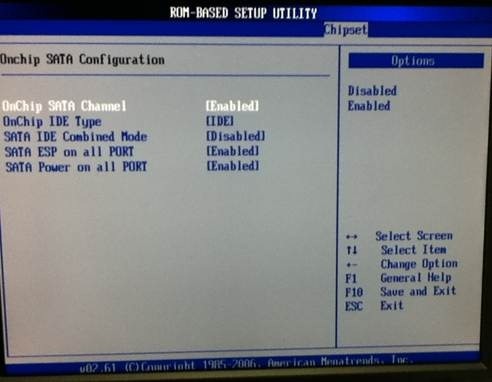 After installing the SSD I loaded Server 2008-R2 Enterprise onto the MicroServer. 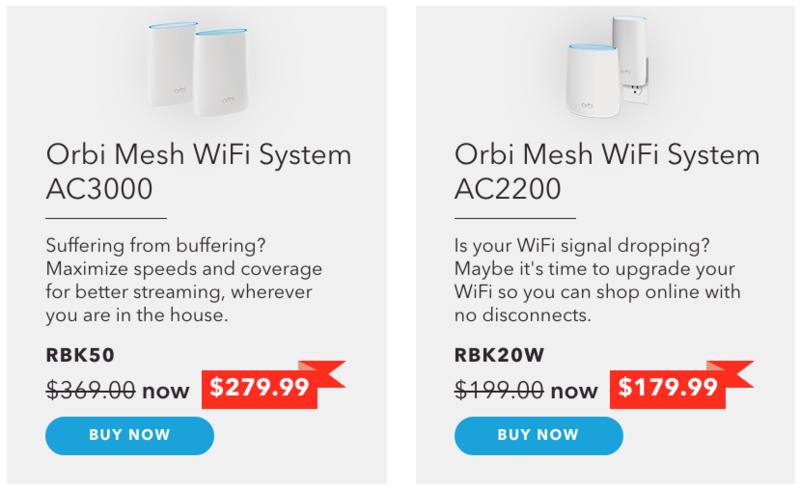 That installation went very quick and surprisingly smooth. I burned the iso for Server 2008 R2 to a DVD and used a USB DVD drive (pictured above) to install Server 2008 R2 Enterprise. I installed my OS onto the SSD drive. 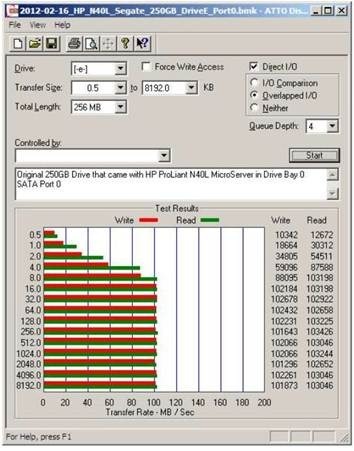 I used ATTO Benchmark to test my SSD and the original stock 250GB Seagate drive. The only glitch was taking out the SAS cable connector from the MB when I was installing the RAM -- there were two hooks that would NOT release when I pressed the connector release -- I finally utilized the screwdriver shown above to bend the connector housing very slightly so that when I pressed on the release the hooks would actually release. 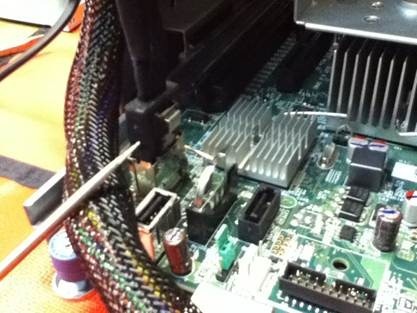 The SAS connector in the picture is released and is mostly out of the MB housing. MB SATA port 5 connector is clearly visible just right of the battery and the MB USB connector is left of the battery. I thought this photo (above) would be interesting -- you can see the SATA cable run as well as the other cables -- it's not necessary to unplug the MB power cable so I didn't. I decided to try some additional drives I had to see how they perform in the MicroServer. 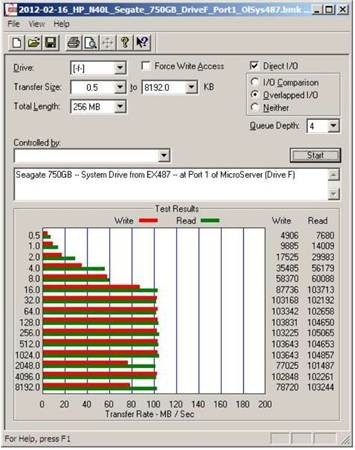 The performance of the stock Seagate 750GB drive wasn't as good as the 250GB Seagate that came with the MicroServer while the performance of the WD20EADS wasn’t that bad. Nice! For future tests I decided to use the WD20FAEX as my drive for my VHD’s and Hyper-V snapshots and the WD20EADS as my Server backup drive. 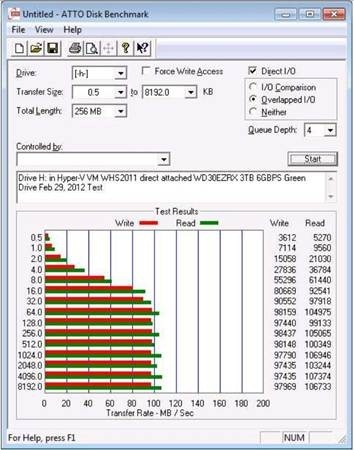 Wish I had a SATA 6G/s VR to test -- I suspect it's performance would be even better that the WD20FAEX since it's about 20% faster (10,000 RPM vs 7,200 RPM) so that should mean read/writes around 180 if it's truly scalable. 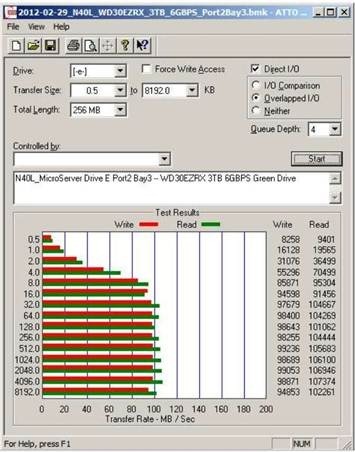 But then it may not be when noting that the VR’s have only a 32MB buffer whereas the WD20FAEX has a 64MB buffer. 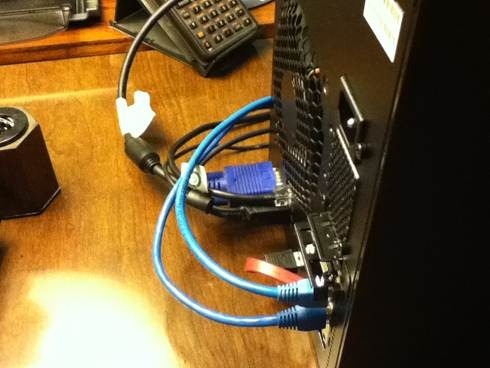 Well, I couldn't leave good enough alone -- I decided to see if I could move a drive into my open ODD Bay on top of the MicroServer and tie it into Port 4 (the eSATA port). 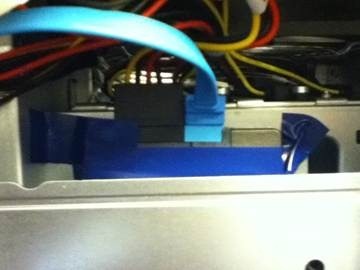 My OS SSD is still tied to Port 5 and is in the space between the ODD bay and the main 4 Bay (SATA Ports 0, 1, 2, 3) below. 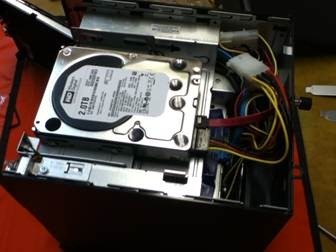 I decided I'd put my WD20EADS into the ODD bay and try it out as a Server back-up disk -- I wanted a green drive up there because the ODD is closed in and I wanted a drive that normally ran cool in that space. I think long term the enclosed nature of this bay could be a detriment to a higher performance drive that generates a significant amount of heat. 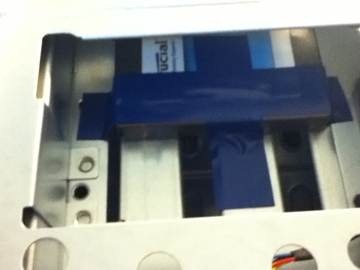 The WD20EADS Drive installed without a hitch -- I used a splitter so that it shares it's power feed with the SSD below it. Pretty much the same as before when it was located in the main 4 drive bay. 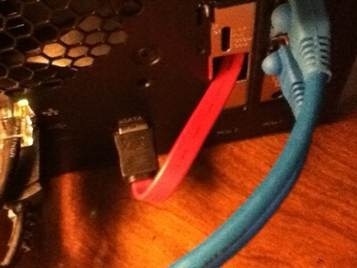 I used the Tripp Lite 18’ eSATA to SATA cable for this run – you can see it disappearing into a blank old low profile NIC plate. 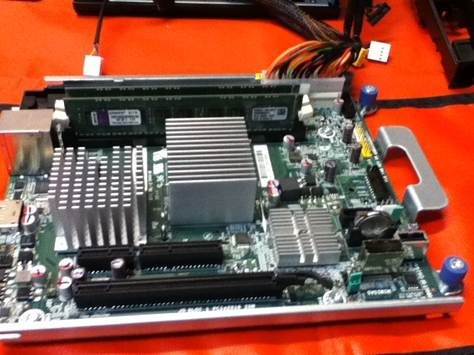 Originally I planned to install an old PCI D-Link NIC I had been saving for an occasion such as this – that’s when I realized a PCI card would not fit into a modern PCI-express slot. I ended up going with an Intel EXPI9402PTBLK Two Gigabit NIC that I could use in a future server build. Now came the really fun part of the evening. In a weak moment earlier in the week I had purchased a Seagate 3TB 7200 6GPS drive that was on sale at Newegg -- I was needing another 3TB so this fit the bill. 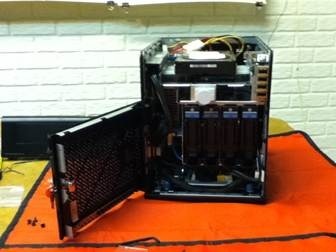 I installed the 3TB drive in the 4th drive bay (far right) in the main 4 bay which meant it was attached to SATA port3. 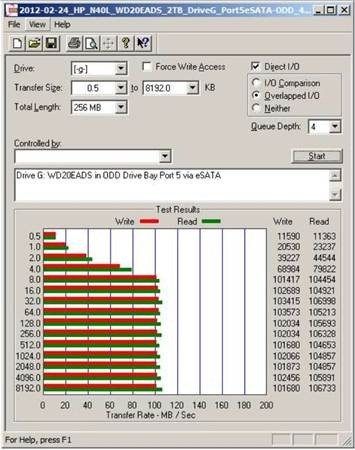 The performance of this drive is SIMPLY AMAZING! Later I successfully passed through the ST3000DM01 to WHS 2011 running in Hyper-V and did another disk test. While there’s a slight change in the performance of the Seagate 3TB drive it is still very good any way you cut it. That is some drive! 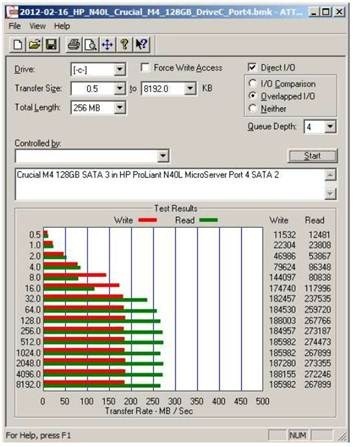 and this performance is with it attached to a SATA II or 3Gbps port!!!!! 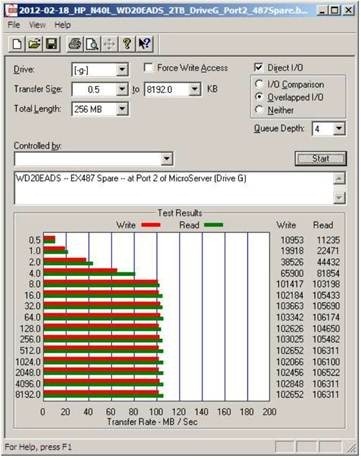 I decided I needed to pull a 3TB WD drive out of my main Client to do a comparison. So that’s what I did. The drive I pulled from my main Client is a Western Digital WD30EZRX 3TB drive that’s a SATA III or 6GBPS. 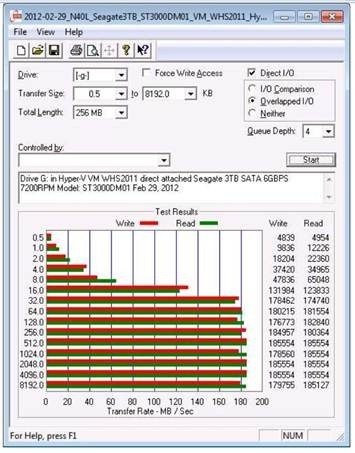 It’s performance was markedly worse than the Seagate ST3000DM01 when tested attached to Server 2008 R2 and when passed directly thru Hyper-V to the VM of WHS 2011. 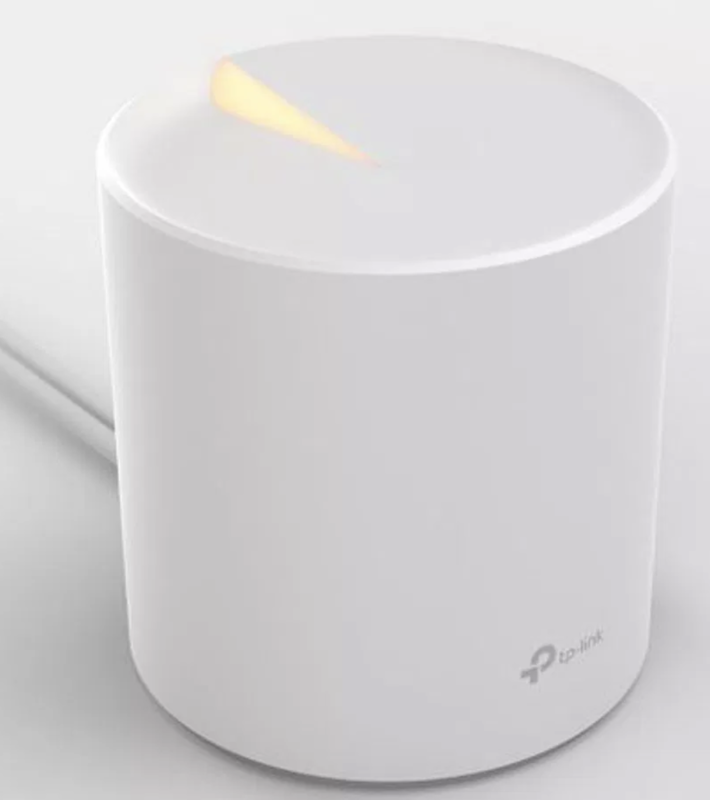 The MicroServer Owners Club on the OverClockers Australia Forum member Doodz has a comprehensive write-up on the power useage of the MicroServer. I found that the MicroServer had a start-up peak of about 101VA (Volt-Amps) ran idled at about 61VA. In this “filled” configuration I found that the MicroServer had a start-up peak of about 111VA and ran idled at about 66VA. I plan to do a lot more testing with my MicroServer. 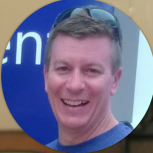 I’ve found the MicroServer to be an excellent learning tool and have been using it to try things out as I work my way through some of TechNET’s eLearning courses. 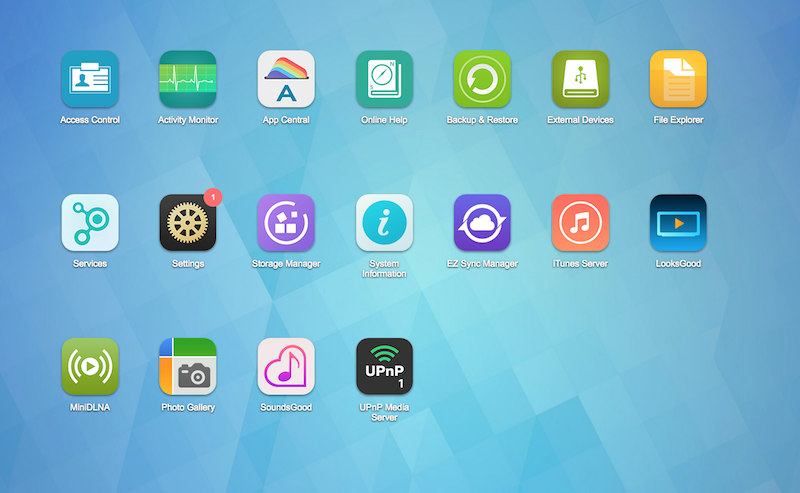 Being able to easily set up a virtual machine on the MicroServer greatly expands its versatility and usefulness. 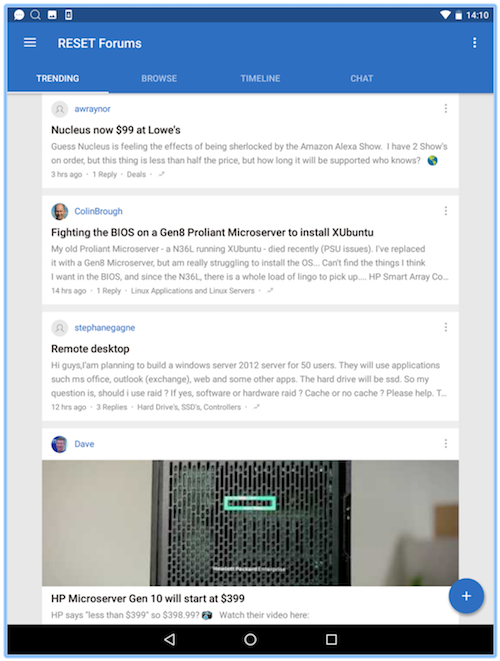 Check out the links to the variety of user groups (below) for lots of great ideas on the possibilities with this MicroServer. 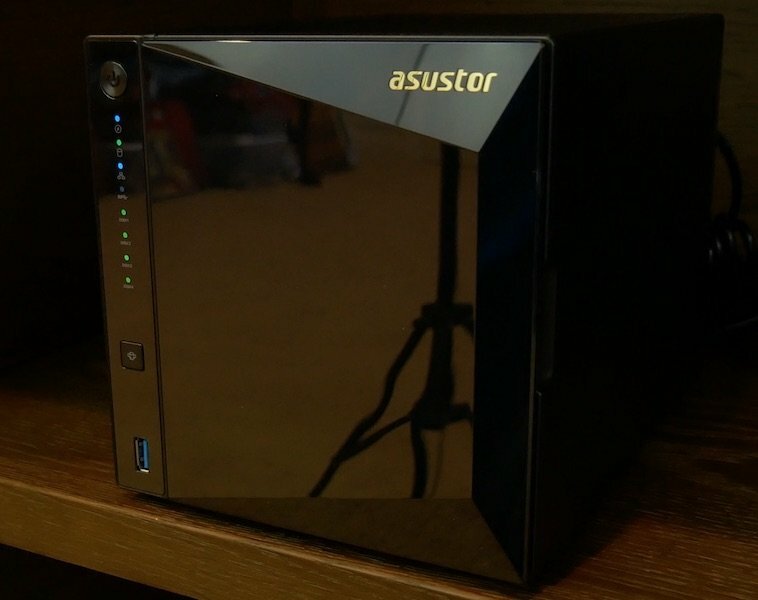 This is also a great little file server for the small business and the home. I’ve found it to be very reliable and easy (and fun!) to work on. Many people in the Home Server Community were very instrumental in helping me figure out this fun machine. I’d like to thank everyone in the forums for their helpful suggestions and insights. Here is a YouTube of the teardown. 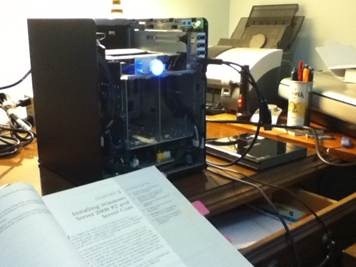 Without SATA 3, I would have to pass. 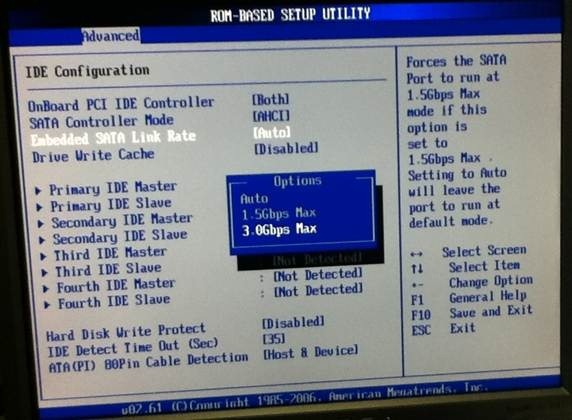 Note: I have discovered that if you have an HP Smart Array P410 hardware RAID controller, and disable SATA IDE Combined mode with this BIOS, the Microserver will suddenly fail to see your RAID controller. You will no longer be able to boot from the controller OR see any drives in the array itself until you enable Combined mode again. I would assume the same applies if you have a P212 or P411 controller. Given that no hard disk can saturate a SATA-II link that's a silly reason to pass. 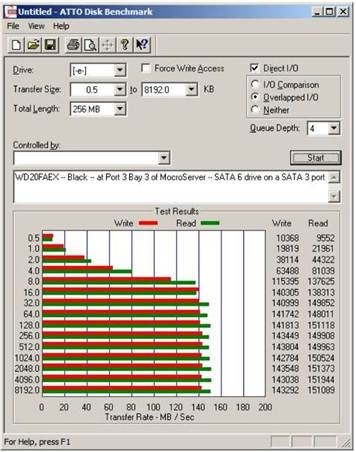 SATA-II is specified at 300MB/s and most hard disks average a maximum of 150MB/s. SSD's might be able saturate the link (since some can manage >400MB/s sequential) but you'd have a bottleneck in the Southbridge or CPU before then on a right like the N40L. Hi Daniel! I've been using mostly SATA III drives even though all 6 SATA ports (including the eSATA port) are SATA II in the MicroServer. Haven't experienced any problems.